I have now installed the PiAstroHub on my Raspberry Pi. It's using Nginx and php5-fpm for the webserver. My QHY5 should arrive today or Saturday.... will report on how it performs late on. First post here, but been reading loads! 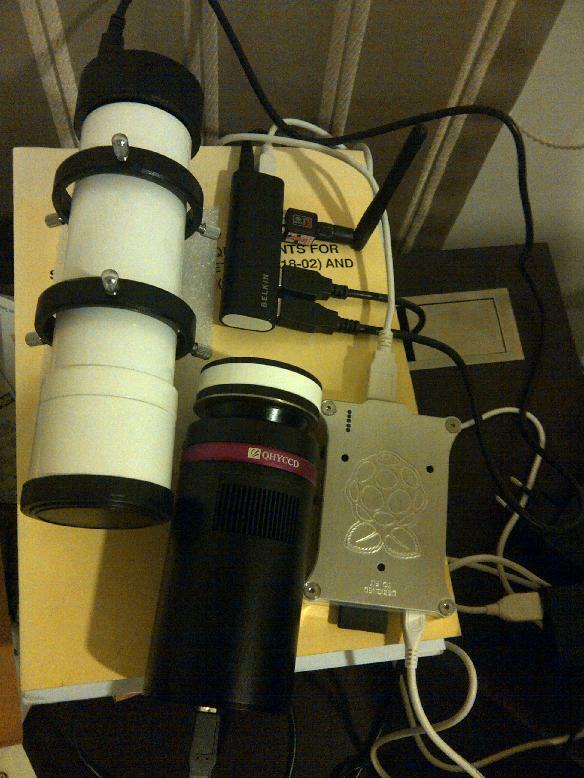 Thanks for a great post on integrating the Pi with a scope! I have a Skywatcher 130p AZ Goto with the latest synscan firmware. I am quite IT literate (I'm an IT consultant! ), so I do understand all wonderful the things you are doing. I am mainly a Windows consultant, but do come across Linux and use it daily so I am quite comfortable at the command line. I have tried the above on my Pi, but Sky Safari will connect briefly, then ALL tcp communications stop until I reboot the Pi! I have tried changing a few things inthe ser2net.conf file such as prefixing it with 192.168.0.114,5555 that should only use my WiFi adapter and keep the LAN connected. One thing though, I do have the WiFi connected to my LAN and not in an adhoc network...is this the issue? Would love to hear from someone, as it's been driving me mad all weekend !!! I didn't have the issue. I mainly use Ethernet connection. I also tried Wifi connection using an Asus N10 USB adapter once without any problem but it was a bit slow. Is your Wifi adapter connected to a powered hub? It is recommended to use a powered hub because the power from Pi is not sufficient. I have the 256MB version of the RaspberryPi. Are you using the 256 or 512MB version? Also, are you overclocking the processor any? This is going to be my next project. My name is Klaus and I am new to this forum, but familiar to many kinds of guiders and also a bit to Linux. I have bought a RaspberryPi (Rev. B) and installed the actual 2012-10-28-wheezy-raspbian.img. Then I followed the instructions from Anat's post from 08/26/12 to install Lin_Guider and the QHY5 driver. Everything went well with no errors at all. When I connect the QHY5, I can see, that it is recognized by the OS (looking at /var/log/messages). I started Lin_Guider and configured it to "QHY5". Is there a chance or are there any plans to enable binning on the QHY5? And what about dithering - has anybody thought about that? I also installed indi & PHD - after that, Lin_Guider worked! use lsusb to see if the camera is recognized. Since the Rasberry Pi seems to have a MIPI CSI-2 camera connector, do you think it would be possible to connect a daughter board with a CCD fitted on it one day? I think the CSI-2 interface may work only for webcams. Anat great work, would this work using the odroid boards. Also what application are you using to capture from and control the qhy8l? Could this work with other dedicated ccd imagers. Congratulations for this project! I'm truly interested on it! Have you done any field tests? I'm mainly interested on autoguiding. Shutting my DSLR is just a secondary objective. It is not tested in the field yet. Please send me your email address. I can send you the code for beta-testing. Interesting project. I am not much of a web programmer, do you have your webinterface control code posted somewhere ? I am very interested in this project and follow for 3weeks. I just ordered a raspberry pi. I'd like to know if it is possible to connect a DMK cam on the raspberry pi. Would there be any power issue with the cam ? I will release the codes soon after some tests from beta testers. Recently, I use the MK808 dual core Android TV stick for this project because it is much faster, smaller and cheaper overall. I am not sure about DMK cameras. To use it for autoguiding, you may need to look at GoQat which supports the camera. I successfully compiled GoQat on Raspberry Pi some time ago. Are you running MK808 on Linux or Android? I am assuming for this project, you are fork-lifting the whole thing to make it Linux for easier to support?? BTW, if it ends up to be not the optimal solution, one can always change it back to XBMC video player . On that front, will RaspberryPi or MK808 be a better dual-use solution? Buying the right type (for picuntu) would be quite a challenge. Anyway, $40-ish price tag (808 cloned version) for a 1.5GHz A9 quad core, 1GB RAM, 8GB NAND flash, HDMI out, USB, USB OTG, WiFi, and Bluetooth all included is not bad. Not bad at all. Yes. I run Ubuntu (PreAlpha 0.3) on MK808. It is very stable. MK808 is a better solution.